New Delhi. Activist Tehseen Poonawalla, Congress leader Shehzad Poonawalla and other Congress leaders on November 6 arranged a meet to mourn the deaths of those who died from standing in serpentine queues outside ATMs and Banks post-Modi Government's move to demonetise currency notes of 1000 and 500 on November 8, 2016. Speaking to Newsforall.in, Tehseen Poonawalla called the demonetisation move an act of terror that claimed the lives of over 100 people. He asked, "In which country would a Prime Minister be allowed to get away after killing over 100 people so mercilessly?" He also took on the Prime Minister for the 'massive failure' that demonetisation has been. He said, "Demonetisation has not shown any benefit, it has just been a reason of pain to many and yet we don't know one way that the move has helped the citizens of the country." He also pointed out at the failure of the government to extract black money in the system by the move. "No black money has been extracted through the move, then why did the Prime Minister make so many people suffer for something that is going to do more harm than good?" he added. He further questioned Prime Minister Modi's silence on the deaths caused by Prime Minister. He said, "How insensitive is the Prime Minister who does not have anything to say for the people who died for the decision taken by him? If he thinks that those people sacrificed their lives for the betterment of the nation, why does not he give them the respect of martyrs?" He also questioned the changing goalposts of the Modi-Government regarding the move. He said, "First they said it is about black money and we did see any effect on black money circulation. They said that it would stop terrorism and stone pelting, yet most numbers of jawans and security personnel died after the move, the move to demonetise harmed more that it helped, however, the Prime Minister chooses to remain in denial." 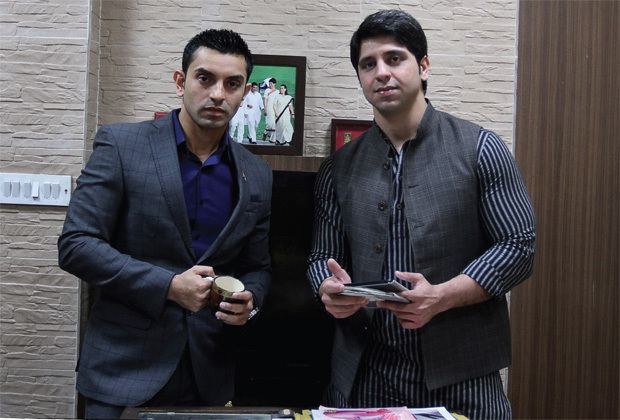 The Poonawalla brothers Tehseen and Shehzad organised a "Shokh Sabha" at Constitution Club in the capital to pay tribute to those who passed away, waiting in long queuesoutside banks and ATMs during Demonetisation last year. The brothers who also moved to NHRC demanding a compensation of Rs 1 crore per life lost, were joined by several senior politicians as well as family members and friends of those who passed away during the Demonetisation drive. Tehseen Poonawalla, Founder MASUKA said "There were these 100 plus people who died black money holders? If not then what is this government celebrating? All the black money has got converted into white and only the common people have suffered & even lost their lives. No one has bothered to reach out to these families. If any person killed more than 100 of our fellow citizens we would call it an act of terror. This is exactly what Demonetisation was, an act of terror! " Shehzad Poonawalla leader Congress said "The PM said Demonetisation was to fight black money and terrorism. One year down the line we see terrorism has only increased and with the Paradise Papers leaks we see no action has been taken against the real black money holders. The only thing that Demonetisation achieved was a fall in GDP and lots of inconvenience for the common man. These 125 plus people died in queues outside banks, if Demonetisation was to fight terror, why not confer martyr status on them ?" 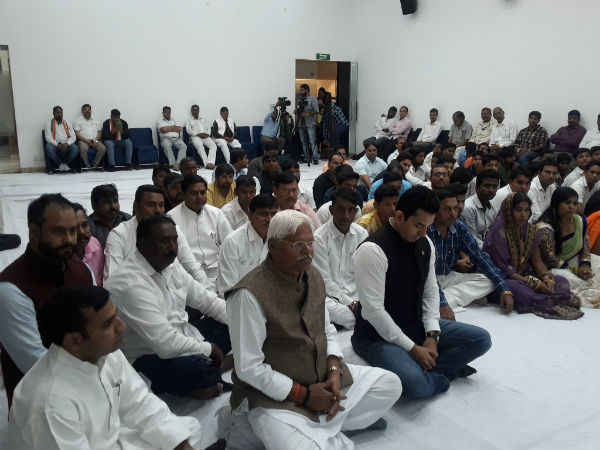 Senior leader and ex MP Mahabal Mishra said “Not one person had gone to Jail for black money "The people here are those common men and women who lost their loved ones." 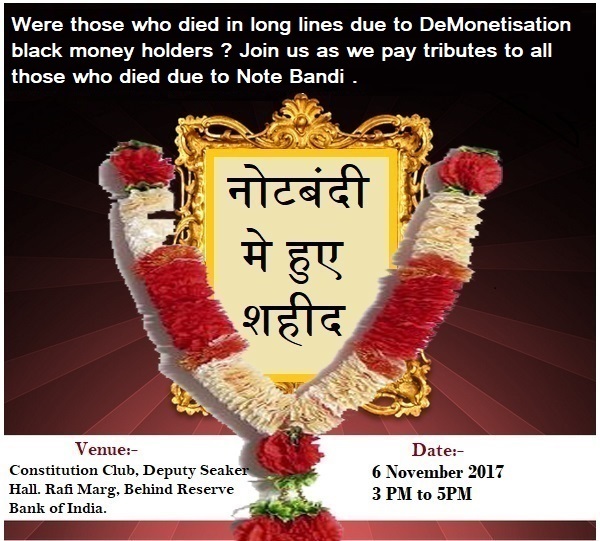 As the opposition unites to call the Demonetisation anniversarya"Black Day" today's Shok Sabha by the Poonawalla brothers is the beginning of the opposition attack over the government for the 8th November decision which certainly should make the coming week interesting specially with Gujarat elections round the corner.